'One of the best love stories I've ever read.' Angie Thomas, bestselling author of The Hate U Give. 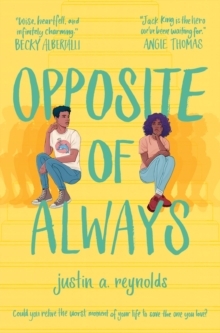 From debut author justin a. reynolds comes The Opposite of Always, a razor-sharp, hilarious and heartfelt novel about the choices we make, the people we choose and the moments that make life worth reliving. Perfect for fans of Nicola Yoon and John Green. When Jack and Kate meet at a party, he knows he's falling - hard. Soon she's meeting his best friends and Kate wins them over as easily as she did Jack. But then Kate dies. And their story should end there. Yet Kate's death sends Jack back to the beginning, the moment they first meet, and Kate's there again. Healthy, happy, and charming as ever. Jack isn't sure if he's losing his mind. Still, if he has a chance to prevent Kate's death, he'll take it.